The word Haejangguk means "a broth to chase away a hangover." The pot used for cooking this type of broth is called Tukbaegi, a small, dark porcelain which is glazed once. 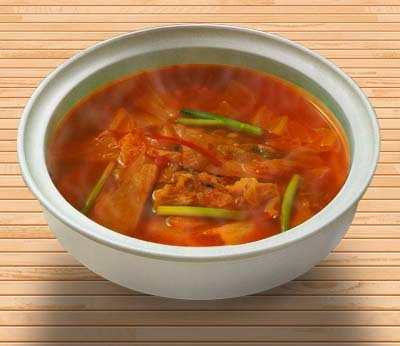 Kimchi and rice Haejangguk is a cherished dish especially by those who suffer from a hangover. cabbage kimchi clean the leaves of stuffing. Squeeze to drain liquid, and mince. beansprout remove sprouts from heads and wash.
anchovy remove foreign materials and boil in water to make the base soup. Put kimchi and beansprout in the boiling base soup and keep boiling. Put a bowl of cooked rice in a Tukbaegi. Add the base soup. Add shrimp juice and scallion. Put the Tukbaegi on a stove and bring it to boil. When rice gets thick, break the egg and put it in the broth. When the egg is half-cooked, turn off the stove. Serve the broth in its Tukbaegi. Put the ground chili and sesame seed on the side.